With the heat index supposed to hit triple digits for parts of the Treasure Coast, this means pretty toasty conditions for those who work outside. 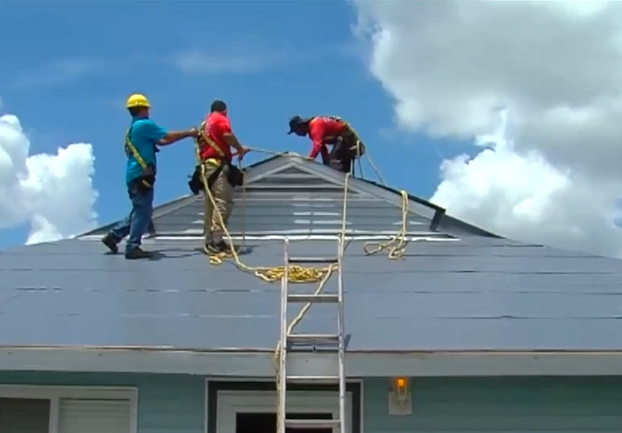 Roofing companies like All Area Roofing & Construction in Fort Pierce are making sure their field crews load up on ice and water before heading to a job site, but they stress the safety doesn't stop there. “Now once they get to the job we have what they call toolbox talks and they stand around a truck before they even do the job and talk about the job, and of course we talk about heat and what we should do," said roofing consultant Donald Miller. Prevention starts with staying hydrated, but Miller said it's also about knowing the first signs of heat exhaustion. And it isn't just roofing companies that need to worry, but anyone who plans to spend an extended amount of time outside in the heat. "Dizziness is a great symptom, red blotchy skin is another symptom and so is nausea," said Miller. Marcos Lopez, an operations manager said it really takes conditioning to work in this type of extreme heat. "You couldn't be a first-year roofer and then spend all day, 8 hours in 100-degree weather, you can't do that, you'll fall out," said Lopez. NewsChannel5 decided to measure the heat at one of All Area Roofing's job sites. Around noon, our heat gun measured 144 degrees. We are told that temperature is pretty tough, even for the strongest of roofers to handle. "Everybody likes it sunny and 75 outside, that's like perfect, right? But we are roofers in Florida this is what we do, this is what we are used to," said Lopez. Often times companies require employees to take year-round safety courses that talk about working in the heat. All Area Roofing said they require its employees to take a break every two hours.